It seems like only yesterday friends were pleading with me to check out this new fantasy show called Game of Thrones. Described as being kind of like Lord of the Rings but with rude bits, I was fairly intrigued. But like many fans before me, I couldn’t have anticipated just how overly invested I would eventually become. I never could have guessed how I would count down the hours to new episodes; listening to endless fan theory podcasts in between to sate my nerdy appetite. Now the final season is sailing slowly into view, a prospect both longed for and feared. How can the final scenes possibly wrap up years of speculation in satisfying way, while remaining true to the shocking twists and turns which set the show apart? The show creators have an impossible task ahead of them. Venturing way beyond book territory, and with a shortened season, they must say goodbye to an unusually large ensemble of beloved characters while keeping the ambitious narrative driven towards the end game. I therefore feel a little bit nervous whenever I see a cast member speaking out about the final days on set, being completely at a loss as to what lies in store for their character, or even what I want to happen. I mean, as much as I like the character of Daenerys Targaryen, would I really want her sat on the Iron Throne; having her dragon children BBQ dissidents? And yet could I even imagine her happily pursuing any other destiny? 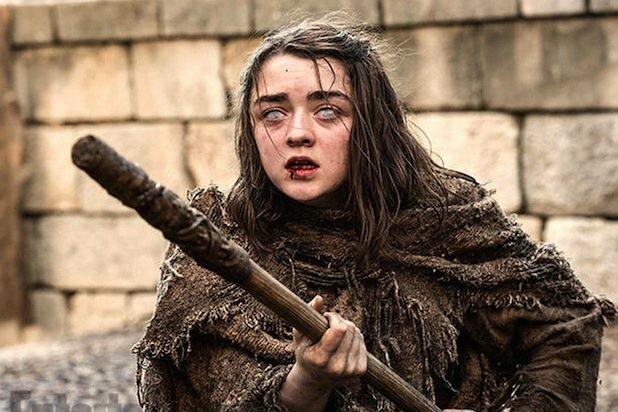 Maisie Williams has now spoken out about filming Arya’s final scenes and I haven’t felt this anxious for the future of House Stark since wrongly believing Littlefinger had driven a wedge between Arya and her sister, Sansa. [The final scene was] beautiful. I ended on the perfect scene. I was alone – shocker! Arya’s always bloody alone. But I was alone and I had watched a lot of other people wrap. I knew the drill, I had seen the tears and heard the speeches. Of course, the filming process isn’t always completed in sequence, and for all we know this could be an earlier scene, with Arya’s final appearance showing her surrounded by loved ones. However, for those of us hoping to see the remaining Stark siblings together until the very last, this tease is more than just a little nerve-racking. Gods be good, we haven’t even seen a reunion between Arya and Jon yet. 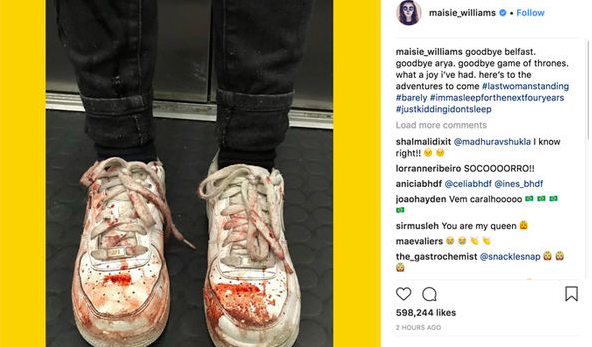 Back in July, Maisie had fans guessing her character’s fate with a telling Instagram post which showed her own (fake) bloodied pair of trainers. goodbye Belfast. goodbye Arya. goodbye Game of Thrones. what a joy I’ve had. here’s to the adventures to come. #lastwomanstanding #barely #immasleepforthenextfouryears #justkiddingidontsleep. 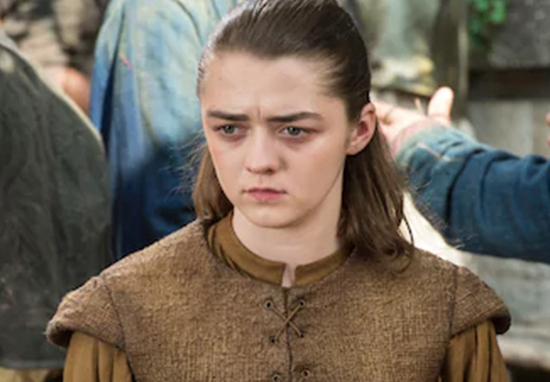 In all honesty, I think Arya would make a pretty good ruler in her own right; being a brave and intensely focused force to be reckoned with. Plus, with all her many faces she would make an ideal politician. What is everyone else thinking?